The subscribers scheme was set up several years ago when many regular supporters of Veteran Tapes asked if they could have each new release sent to them with an invoice. We then decided that we would also give them a substantial discount on such orders. The scheme has grown, so that if you become a subscriber we will now also give you a discount on the other labels in our catalogue. As a subscriber you will receive each new Veteran release, invoiced with a 15% discount (not usually more than four releases a year). As a subscriber you can also order past Veteran releases at the same discount. As a subscriber you can order anything from our other labels catalogue with a 5% discount. As a subscriber you can even have a monthly standing order so that you can build your collection and spread the cost over a year. 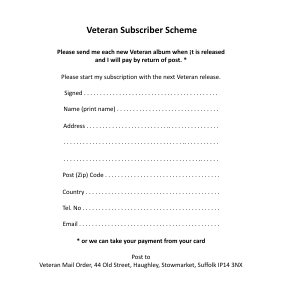 Just print out the form and fill it out, post it to us and you can become a Veteran Subscriber! Click here to download a pdf of the form.